You'll need to have connected to the TeamSpeak server at least once and you'll need your TeamSpeak UID (Ctrl + i in the TeamSpeak client) in order to get a channel. If you have any problems please report them here and we'll fix it. CS:GO: Map voting system updates for the Competitive servers. Previously on the second to last round of a match you would be prompted to vote for a map. This vote has been removed. You can now nominate and RTV every single map in the pool bar the map that was previously played, no more choosing between maps no one wants to play. You can now nominate and RTV every single map in the pool. It's been a little over a year since our last update and we're now finally getting things moving. In the coming weeks we should have a new site, improved forums and we'll be a lot more active. We'll also be looking for staff for some of our servers that are in dire need. Once things are closer to being finished I will post a changelog and a list of things we plan to do in the future. We're completely revamping the site and adding new game servers so there may be a few bugs! We're smoothing them out. Once we're done we should have a much better server list, homepage and better site in general. - A few more arcade games. 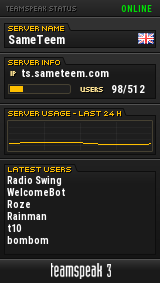 - An updated home page with TeamSpeak connect link/statistics. - Tapatalk added for mobile users. Updated server list coming soon! Credits on the site have been updated and reset. Theme is being messed with. Server updated, map was reset to get the lovely new biomes.